Author: Pius N. Tamanji †. Series edited by: Wilhelm J.G. Möhlig, Bernd Heine. 12 pp. Roman, 228 pp. 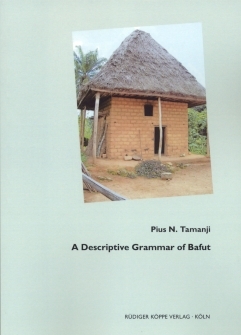 A Descriptive Grammar of Bafut, a Grassfields Bantu language spoken by approximately 105,000 people in Cameroon (as of 2005), integrates in a single volume some of the major areas of the structure of the Bafut language that have been intriguing to researchers in the past. The language is a part of the geographically defined group of languages in the grassfields of Cameroon with to some extend Bantu-like characteristics (Bantuid classified). The introduction identifies the language and ist speakers. Chapters 1 and 2 cover the sound system and noun classification while chapter 3 provides an interesting account of noun formation processes including an interesting derivational process which involves the use of a negation prefix. Chapter four contains a detailed description of the pronoun system and chapter 5 covers the noun phrase with an impressive categorization of genitive constructions. Chapter 6 describes verb morphology with a detailed and interesting coverage of verb tone classes and verb extensions. Chapters 7 and 8 discuss the tense system, the interaction between tense, mood and negation, as well as the role of deficient verbs in marking tense, aspect, and mood. Chapter 9 begins with a presentation of familiar prepositions in the language and proceeds to show that other prepositional and adverbial notions are marked by complex structures derived from body parts and related plain nouns. Chapter 10 describes the formation of questions and relates this to processes involved in focus and relativisation. Chapter 11 describes complex constructions beginning with the familiar verb serialization structures in Bantu and moving on to consecutivisation, coordination and subordination. Chapter 12 concludes the book with a presentation of what the author calls curiosities in Bafut grammar. These curiosities, which constitute phenomena with an areal scope in the Grassfields region of Cameroon, include homoganicity, reduplication, and anaphora. The present book is the most comprehensive descriptive treatment of Bafut grammar available so far. Each chapter flows from the known and familiar to the new and complicated. The reader will definitely be struck by the density and detail of the analysis especially as the author provides rare insights into the semantic domain: insights that can only be obvious to a native speaker. Besides the wide range of topics the book treats, the author consistently indicates areas that could be further explored in Bafut and in other Grassfields languages. These areas include: the mechanism of forming compound pronouns; the mediopassive as a verb extension type; the interaction between tense and negation; the behavior of deficient verbs with respect to negation; the relationship between content question formation, focus marking, and relativisation; coordination, subordination, serialization, consecutivisation, homorganicity, reduplication and anaphora. These will serve to motivate fruitful research in the Grassfields Bantu languages of Cameroon.